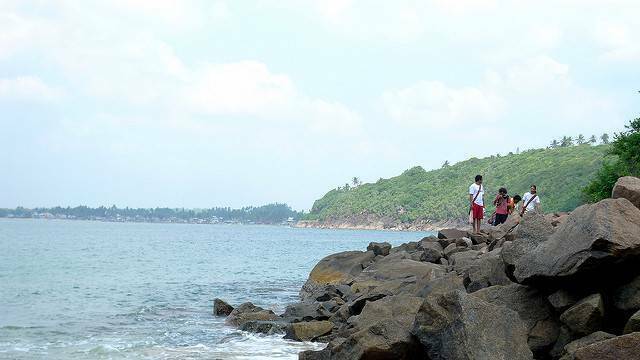 The Jungle beach is located between Galle and Unawatuna. This place is less known to tourists and is thus less crowded which makes it appealing for the people visiting this place. This beach is basically special for its location since it lies close to the jungle. The clean and sandy beach provides a panoramic view of the city of Galle and a perfect place to watch the sunsets. A good way to reach this place is to take a tuk-tuk to Unawatuna. You can also go to this place on foot which is a through a very beautiful trail which is clearly marked. The place is also accessible through boats and is a different experience altogether. The beach has several beds and places to lie down and relax. The place also has decent restaurants which serve excellent food. The jungle beach is the perfect place for snorkeling where you can see some colorful fishes. The equipment and gear required for snorkeling is available on rent and can be obtained easily. The jungle beach is a peaceful and quite little beach, which is great for swimming!